The Giant Knotweed is a garden escapee with Japanese roots that Environmental Protection Agencies in Europe and North America classifies as an invasive specie. Companies in these regions use poison, dynamite and excavators to help land owners in despair who want to get rid of "the growing curse of the Giant knotweed". By making pan flutes of it's hollow stems, I suggest a different relation to the Giant Knotweed, based on mutuality and creativity. 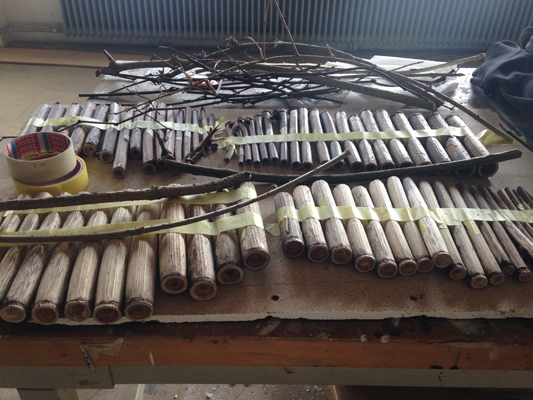 In April 2015 eight people living in Malmö visited the place next to a highway where the knotweed stems that I made the flutes from once grew. Each member of "The Japanese Knotweed Panflute Ensemble" choose a flute and spent time in the shrubbery. The situation resembled a plant meditation or a "jam session" where perception and breathing was as important as playing tunes on the flutes. We closed our eyes, filled our lungs with air and listened to the roar from the highway and other sounds together.